An artist rendering of Star Wars Land. Now that we’ve had some time to recover from the R2D2-style head-spins we all did after the announcement that a Star Wars-themed land will be coming to Disneyland, we’ve honed in on why the news is so good. Not only will the 14-acre Star Wars Land introduce a much-needed new experience (the last major addition to Disneyland park was Mickey’s Toontown, opened in 1993), it will also create space, pun intended, for Tomorrowland to re-embrace its roots. If we’re being totally honest with ourselves, we all know Tomorrowland was never the right fit for Disney’s Star Wars properties. Though both concepts may be space-themed, Tomorrowland celebrates man’s experience with space in the future, while Star Wars involves adventures in space that took place “a long time ago.” Walt Disney’s vision for Tomorrowland, which was one of the five original lands in the park, was to provide “a living blueprint of our future,” and a glimpse into the science, technology, innovation, and exploration of what Disney envisioned as the forthcoming space age. Opened in 1955, Tomorrowland originally represented the future in the year 1986. The Star Tours attraction was added to Tomorrowland in 1987, replacing an attraction called Adventure Through Inner Space (anyone remember riding an atommobile?!). On Star Tours, passengers board a simulator and watch one of 50 possible story combinations set in the worlds of Star Wars, all of which, if you’ve paid any attention to the opening crawl of the films, exist in the distant past. Some Star Wars enthusiasts posit that George Lucas placed his series in the past, and in a galaxy “far, far away,” in order to free himself creatively from our laws of physics, as well with any suspension of disbelief audiences may have with our own history and technologies. Essentially, Lucas gave himself license to make the whole world up. Meanwhile, some well-read fans of Star Wars Expanded Universe—the officially licensed, fictional spin-off material of the Star Wars saga—have surmised that the series begins in the 1700s, Earth-time. 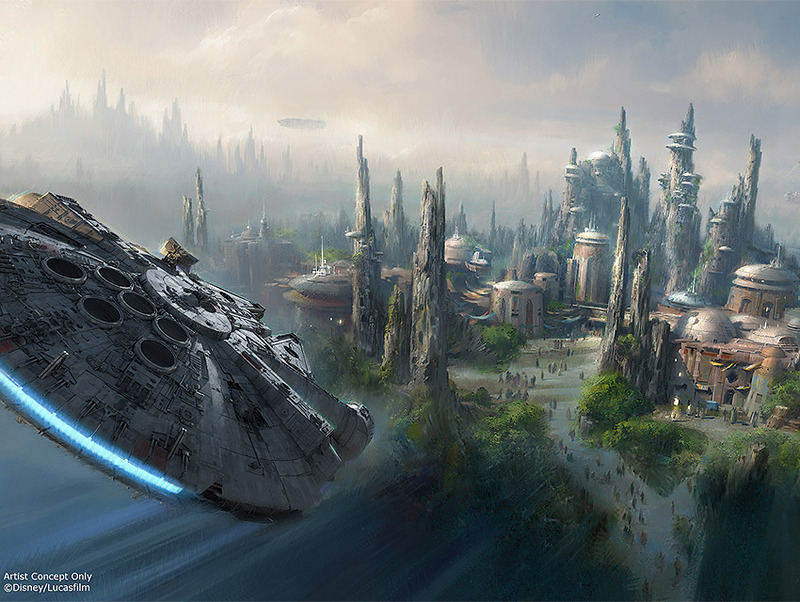 Regardless of exactly when in our past Star Wars takes place, Star Wars Land at Disneyland park will feature two attractions set in a remote frontier town on the outer rim of the Star Wars galaxy. The description of the new land, though sparse on details, sounds as if it will be designed to represent a dustiness and disorderliness possibly fashioned after the planet Tatooine, standing in healthy contrast to the polished, disinfected, systematized representations of space one finds in Tomorrowland. It’s as if Disney has finally figured out that, no, no, NO. THIS one goes HERE, THAT one goes THERE.